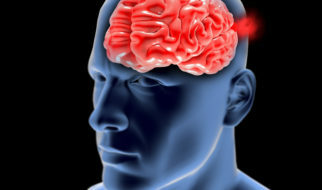 A brain aneurysm is a weak spot on the wall of a blood vessel in the brain that fills up with blood. The aneurysm begins to grow and eventually can rupture. A ruptured aneurysm leaks blood into the area around the brain and can be deadly. Risk factors for developing a brain aneurysm include smoking, high blood pressure and family history. If you have some or all of the following symptoms, seek immediate medical attention. A ruptured aneurysm is very dangerous and could be a life or death situation. Coil Embolization is less invasive than surgical clipping and is performed in radiology. The radiologist and neurosurgeon at Boone Hospital thread a small catheter or plastic tube from the artery near the hip to the aneurysm in the brain and then insert a thin wire into the aneurysm. The coil fills the aneurysm so it can clot off and then heal. The physicians at Boone Hospital have been treating aneurysms with coils since 2001, longer than any other hospital or physician in central Missouri. In the operating room, the neurosurgeon operates through the skull and an aneurysm clip is placed at the neck of the aneurysm. This seals off the aneurysm and prevents it from rupturing. For more information, visit the Brain Aneurysm Foundation website.